The endocrine system consists of ductless glands that secretes chemical messengers known as hormones which circulate in blood stream to reach different organs. Glands that secrete hormones directly into bloodstream are known as Endocrine Glands. It is a part of a brain that secretes hormone known as Neurohormones. They can be releasing hormone or inhibiting hormone. It do not release hormones directly into the blood stream. 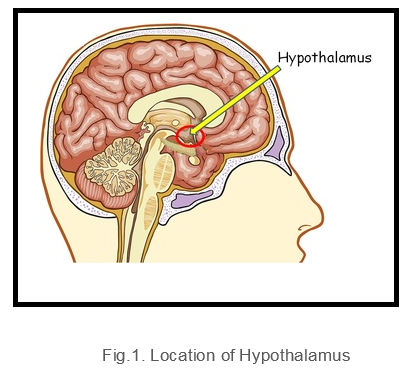 Pituitary Gland is located as a protrusion off the bottom of the hypothalamus and attached to the hypothalamus by a stalk known as infundibulum. The pituitary gland is divided into anterior pituitary and posterior pituitary. Growth hormone promotes growth of tissues and organs. This hormone helps in incorporation of amino acids into proteins. Prolactin is a peptide hormone which stimulates mammary glands for milk secretion. Adrenocorticotropic hormone stimulates adrenal gland to secrete corticosteroids. Thyroid stimulating hormones (TSH) stimulates thyroid hormone secretion from the thyroid gland. Follicle stimulating hormone promotes gamete formation in male and female, that is, sperm and ova respectively. 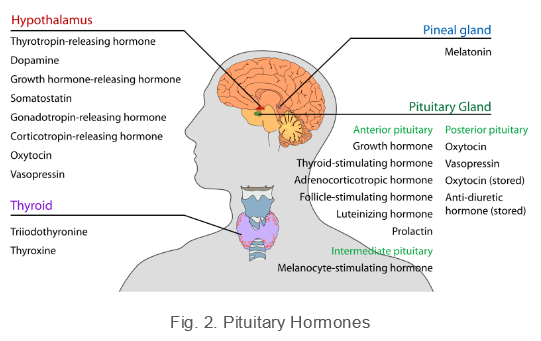 Luteinizing hormone controls secretion of male and female hormones. It stimulates release of ova from the ovary in female (known as ovulation). In males, it promotes secretion of testosterone hormone. This hormone helps in development of secondary sexual characteristics in males such as moustaches and beard. Melanocyte stimulating hormone stimulates brain activity in humans. Posterior Pituitary also known as neurohypophysis. It releases two hormones. Oxytocin is a naturally occurring hormone in our body. It helps in inducing uterine contractions at the time of labour. Vasopressin also known as antidiuretic hormone acts on distal convoluted tubule to allow more water to be absorbed thus making urine more concentrated. It is located in the third ventricle of the brain. This gland secretes a hormone known as Melatonin which sets the biological clock of an individual. In some organisms such as fishes and amphibians, it acts to detect light. It is located on either side of the larynx. It is a largest Endocrine Gland. It secretes two Hormones – Thyroid Hormone and Calcitonin. Thyroid Gland is made up of two types of Cells- Follicular Cells that secretes thyroxine and Parafollicular Cells that secretes calcitonin. Thyroid hormone stimulates sugar transport, stimulates metabolic activity by increasing the number of mitochondria, stimulates synthesis of respiratory enzymes. It also accumulates iodine in blood which is required component of thyroid function. Calcitonin decreases blood calcium level by decreasing the mobilization of calcium from the bone. It is located behind the sternum and gradually decreases in size after a person attains puberty. It plays a role in immune system by promoting maturation of white blood cells. 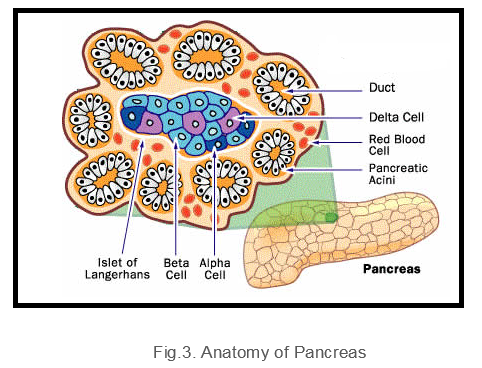 Pancreas is also an endocrine gland. It contains a group of cells known as islets of Langerhans. These cells are of 4 types and each type produces a particular hormone. This gland secretes parathyroid hormone which works opposite to calcitonin. It increases blood calcium level. This gland is located superior to the kidney. Adrenal Gland is divided into – Adrenal Cortex and Adrenal Medulla. Adrenal Cortex Secretes 3 types of Steroid Hormones- Mineralocorticoids, Glucocorticoids and Adrenal Androgens. The most important glucocorticoid is Cortisol. It raises blood glucose level by promoting breakdown of proteins and lipids into glucose. This process occurs in liver. The most important mineralocorticoid is aldosterone. It acts on kidney and promote reabsorption of sodium ions and secretion of potassium ions. The adrenal androgen is DHEA (Dihydroepiandrosterone). It includes hormones such as testosterone. 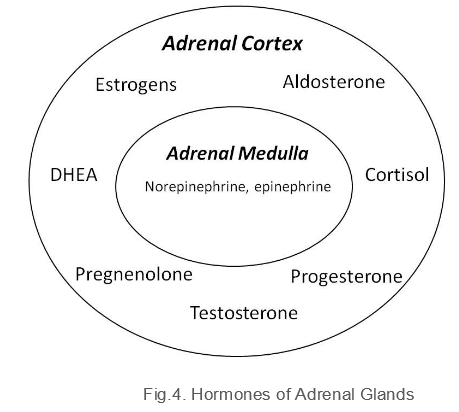 Adrenal medulla secretes two hormones- adrenaline (epinephrine) and nor-adrenaline (norepinephrine). Epinephrine is released at the time of emergency, that is, at the time of fear, fight and flight. So it is known as emergency hormone. Norepinephrine is released during normal conditions. Estrogen regulates ovarian cycle/menstrual cycle. Progesterone is known as pregnancy hormone. It is required to maintain pregnancy during first trimester. Inhibin inhibits secretion of follicle stimulating hormone (FSH). Relaxin is hormone secreted by placenta which increases the flexibility of pubic symphysis at the time of pregnancy. Kidney secretes two Hormones – Renin and Erythropoietin. Renin helps in sodium ions reabsorption to maintain plasma volume and arterial blood pressure. Erythropoietin promote production of red blood cells in the bone marrow. To read more, buy study materials of Chemical Coordination and Integration comprising study notes, revision notes, video lectures, previous year solved questions etc. 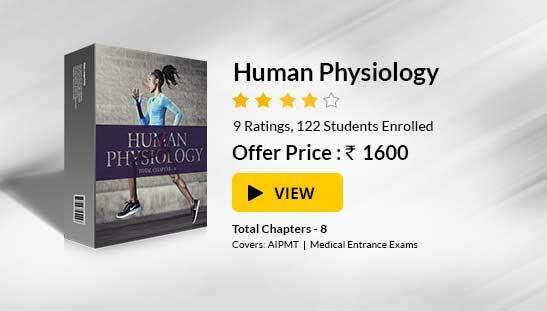 Also browse for more study materials on Biology here.